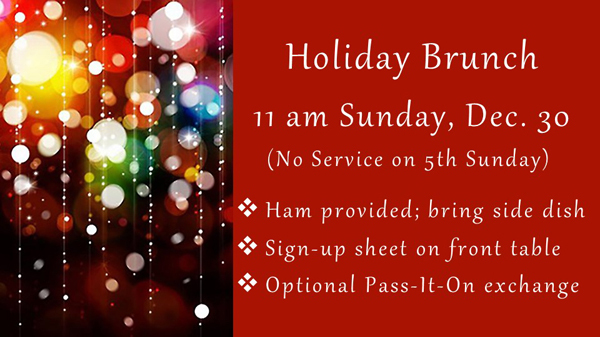 Join us for our Holiday Brunch at 11 am on December 30 to celebrate the holidays (and/or the end of them). Because it’s a 5th Sunday, there’s no service that day, so we’ll eat, drink and be merry beginning at 11. As usual, we’ll provide the ham and you can bring a side dish. The signup sheet is at the front desk. We’ll have an OPTIONAL pass-it-on gift exchange. It will be after Christmas, so if you receive a gift that’ll just gather dust at your house, bring it to pass it on in the exchange.